There exists a company out in the wild called Enphase Energy that makes various solar related products, one of which is called Enlighten. This is software that allows an owner of a solar panel array to track the amount of electricity generated by the array. This data is also uploaded to an Enphase website and the data is made available for download. We here at SolarYpsi have begun developing a procedure that will download this Enphase data for 403 Huron St and make the solar generation curves available through SolarYpsi.org. The early fruits of our labor are already visible! Do note that data may look strange or might even disappear as the kinks get worked out, but it will come back, we promise! One of the most exciting things with this addition to SolarYpsi is the relative ease with which new installations can be added to SolarYpsi. Anybody who is using Enphase products can be included on our website with only a few minutes worth of work and without the need for one of our old laptops. There are already a couple of other locations that may be coming online soon! Everything is all well again on the SolarYpsi website. The server move over the weekend exposed a number of code instabilities and as of Monday morning (October 10, 2011) it was clear the site needed to go down again for more repair work. That repair work has very nearly completed with only a final data move remaining. As a result of this most recent outage, the entire code base of the website has been modified and initial testing indicates it is much more stable. Along with the upgraded server (thank you HDL! ), the new code should be ready to handle what we hope is an ever increasing traffic load. Thanks again for your continued support. Again, please let us know if you find something on the website that doesn’t seem right. In case anyone was wondering, we lost about a weeks worth of solar data from City Hall. The solar panels are fine and fully producing power, but we had a network issue with the laptop that collects the data from the utility meters. All is fixed and we’re collecting data again. 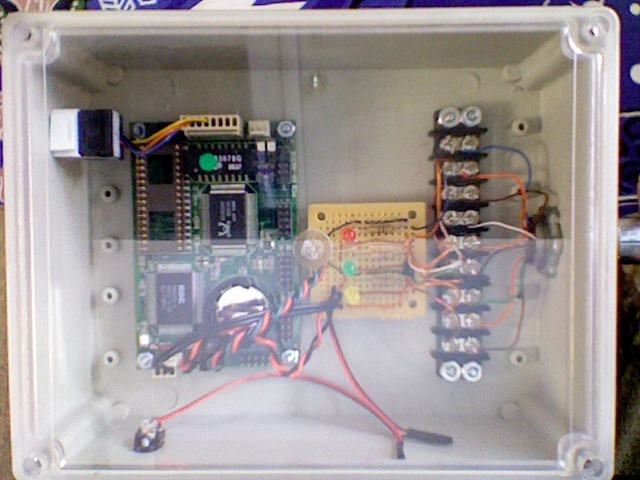 For those of you who know we are planning at some point to launch a JK MicroSystems picoFlash single board computer at the Ypsilanti Food Cooperative to do the data collecting, we wanted to let you know we have completed the housing for the card. The programming of the card is nearing completion as well and we hope to have the whole unit mounted and collecting data soon. Here is a picture of what the housing looks like. A code update happened this morning and the changes were put into the SourceForge subversion repository (revision #6). The consumption chart was modified to better show actual consumption and a couple of bugs were fixed. We have gone and done it again. There is now another chart you’ll need to learn to interpret. This one is a consumption chart that show where the electricity used is coming from. To view this chart, bring up the Daily Chart for a live location and click the ‘Show Consumption’ checkbox. The chart will change within a few seconds to the consumption chart. For those interested in the code behind this wonderful advancement, it has been submitted to the subversion repository hosted by Sourceforge for the SolarYpsi project. Please, go to the project page (here) and rate us thumbs up! It will make us feel better. Yesterday, June 8, HDL (the host of SolarYpsi’s website) experienced problems that are believed to be related to the recent Denial of Service attacks launched against various websites, including some of the United States government. They worked quickly to get us back online and we want to thank them for their effort. Unfortunately, there are significant gaps in the data from June 8. The SolarYpsi development team is working on a solution to help prevent the loss of data in the future if this should happen again. Unfortunately, the method of data collection we had employed for this project (namely MySQL) has caused HDL (our generous site host) many problems. It was bad enough that they were forced to shut down the SolarYpsi.com website. We want to say that the development team is very sorry for the problems caused. These problems have prompted us to re-evaluate how the site manages the data from a location and we have just completed the launch of a new database free method. This should allow us to stay in the good graces of HDL and it is a more direct approach to the data. The SolarYpsi project is now hosted on Sourceforge, the internet home for open source projects. We will be managing code releases through Sourceforge from now on and you are welcome to download the code through Subversion. A bug in the caching code was uncovered on June 1st. It has been corrected and the updated code is available on the SolarYpsi.com website.